Actually I love carnations, except as cut flowers - probably for similar issues of old associations! I've never grown them though; fears about the hardiness kept them out of my earlier garden, and here... well, I don't suppose they're particularly drought-tolerant... :P I hope the two of you will manage to become friends! Hi Amy, I do hope so! Are there hardiness issues with Carnations then ? All I can find out is that they are "fully hardy" ! 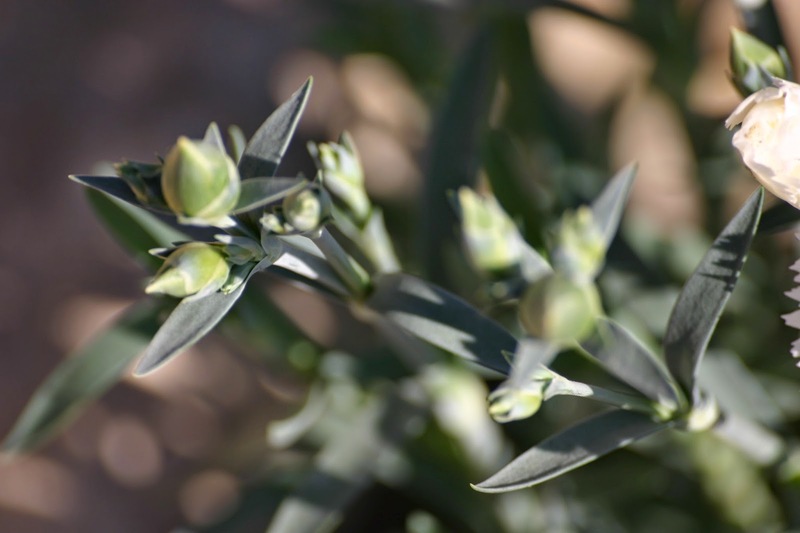 Apparently they're much hardier than I knew; I just did a quick check by USDA zone, and they're said to survive down to zone 3 or 4 - far, far below freezing... But they do like good drainage so perhaps it's just as well I didn't try them in the clay loam of my old garden! I wonder where the idea of them being tender came from?? I think they were underglass because like so many plants in garden centres today they have been forced on to flower earlier than they would in the garden. I bet you are right Brian, as everything is encouraged to flower early ! Carnations must be quite evocative , funny that yours are connected to grandparents too! Do join in if you would like to Nicole and post a link to your post ! It is such a good idea because it means guilt free plant buying! I have some pink ones in the back garden and tried bringing some back to life last year that my Dad had inherited! The pink ones have been going for a few years now - I don't like carnations much either as the pollen gives me hayfever but I agree about the smell being very old fashioned - it makes me remember my grandparents Kentish garden and reminds me of Dad and my husband (who actually states carnations are his favourite flower bless him; we even had them as part of his button hole when we married! Simple tastes and old fashoned we are here. Like your posts as always and look forward to see your next new plant. Hi Ali, carnations and grandparents seem to be wedded together in many people's memories. You have done well to keep your inherited ones going as they are short-lived - only 2 or 3 years apparently (that's what the Horticultural guru that is Google said, anyway!!). That's interesting Sue, how do you do that ? That sounds like a plan ! The ones I bought have certainly not lost their perfume ! Hi Sue, thanks for that - I will check out your post. I think carnations remind us of cheap bunches of flowers from petrol stations. I have even seen some monstrous dyed ones. You have to try and look at them with fresh eyes. 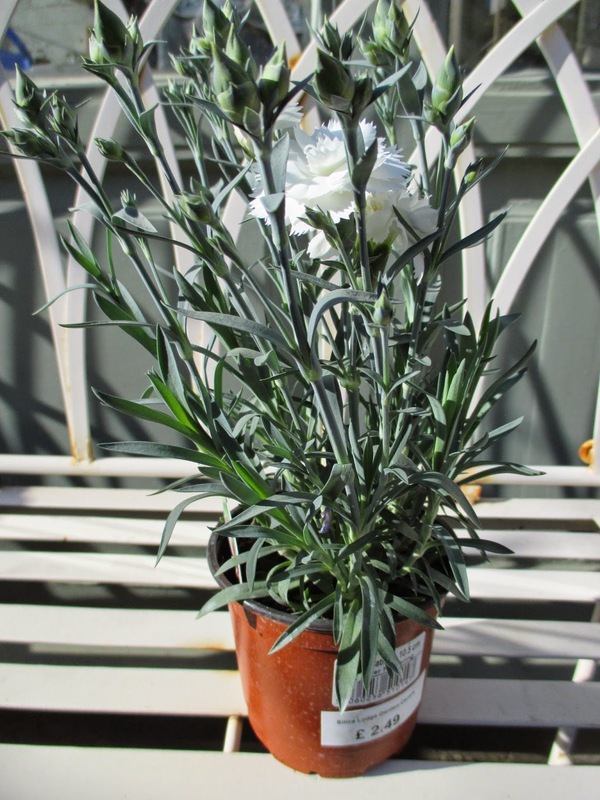 I know someone here in Suffolk who grows the old Victorian Malmaison carnations. They are exquisite and smell divine. Yours is very pretty and I bet it smells lovely. By the way, the Auricula 'Red Gauntlet' you sent me is blooming. It is beautiful. Thank you so much. All the other plants you sent me are thriving. Hi Chloris, so pleased it is flowering already! I shall have to check out Malmaison carnations as I have not heard of them. I love the smaller dianthus pink (D. plumarius) and for the same reason, they were in my grandfather's garden. I am partial to the carnation scent and treat myself to Roger and Gallet carnation soap when I can find it-another item scarce in these parts. Hi Susan, the scent is memorable . I shall look out for the soap as I bet smells amazing. Jane! How can you not love carnations! They certainly are one of my favorites. In parts perhaps there are few plants that do as well in my sunny, well-drained alkaline soil. The one you selected looks a bit like Mrs Sinkins, a plant I associate with my first gardening friend. I am glad you are trying to grow one and sure you will get to like it. The perennial ones have such a strong perfume.They always look neat, even when they are not in bloom. They are so undemanding. As you can see - I like them. Hi Alain and thanks for being such an advocate for the Carnation! I hope I feel the love very soon! It is good to hear how undemanding they are, and if they stay neat then that is a real plus point! Carnations evoke wonderful childhood memoires for me, too, the floirst sort, those big headed, spicey smelling flowers that always turn up in funeral shrouds. We lived next to a grower who had green houses full of carnations. I loved to visit the warm, moist indoor garden and smell the carnations. Here I plant a clump every year, but they don't always over winter well. As for your description of their joints, wonderful. Thanks for stopping by the Garden Spot. Boone, indeed, is a handful. I sometimes think that he should be with a younger couple for he is certainly high energy. We always had short hairs, but our last one was so speicial. As my husband looked for a new short hair, I always saw Max's sweet face in each dog, so we decided to go with Boone. Not a bad choice, a good one, but he is far more independent. But then he is only a kid. Hi Ann, as you say he is only a baby with a lot of maturing to do! Our effort is always repaid ! I bet the smell in those carnation glasshouses was unbelievable! Hi Anna, I am unsure where a carnation ends and a Pink begins, especially when a Pink isn't pink! Thanks for your pointers! I inherited a whole load of pinks along with the house.. Pink ones too! I moved them around a couple of times hoping I'd find the right spot but the pink was so electric they never really fitted in. The mice, bless them, have now solved the problem for me.. They've eaten the lot! So mice have some point then, Jessica! usually they eat the one plant you are really nurturing! I do want to love them (carnations - not mice!) but it is an uphill struggle! I agree, they are too straight and stiff for me ... but then I love Auriculas, so I am just fickle ! I thought for sure you were going to say Carnations remind you of funerals! 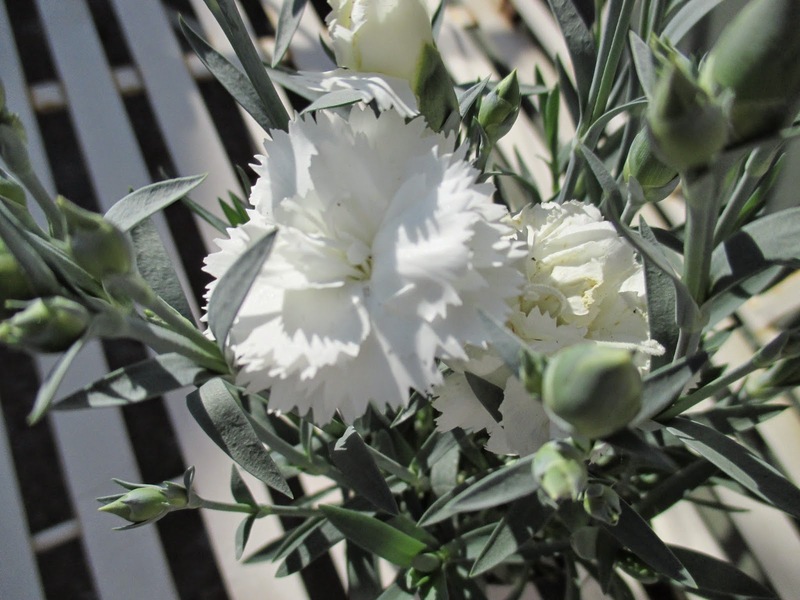 They're used in funeral arrangements a lot here and that's what I think of when I see the big ones.....However, your white Carnation is stunning! How can white be anything but white?? The color is so pure.....lovely. I don't associate them with funerals, so maybe they are not used so much here . They are traditionally associated with weddings, particularly as button holes for the men. Hi beth, I agree that plants are common for a reason - usually a good one, so being common is usually a sign of a good plant. Carnations really seem to divide opinions ! I will try to learn to love ! 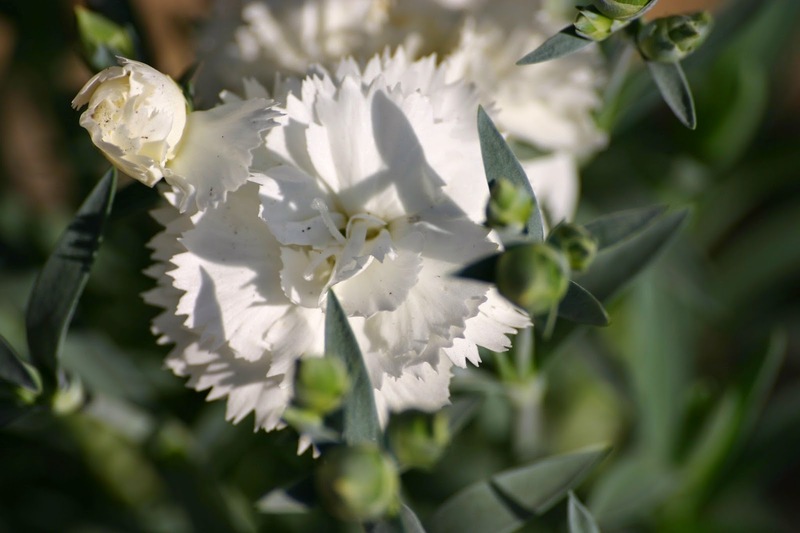 Carnations and pinks used to be so fashionable and a plant that many a gardener grew, not just for the scent of the flowers but for the ease of propagation. Unfortunately they are very much out of fashion now but I did plant up couple of troughs last year in one of the few places in the garden to get some sun and I am quite pleased I did as they certainly evoked some memories of summers gone by. That is so true Rick, they are right out of fashion! Will you grow them again this year ? The plants (pinks) have survived the winter and are already sprouting flower stems. This is a very interesting exercise, Jane. I share your lack of appreciation of carnations. I suppose it reminds me also of my childhood, and how men used to wear them in their buttonholes - whatever buttonholes were! I wonder if you will learn to love them. I should do something like this, I tend to buy what I know and even if I love a plant tend not to buy it unless I have an idea where it will fit in. I guess that is a bit of a rut. Hi Sue, those memories are so strong aren't they, and it is hard to get around them ! If indeed you are in a rut, it is one funded on good practice! I am trying to move out of my comfort zone with what I buy, but it is purely plant - driven,and not place - driven, which leads to some random purchases I guess. maybe to counterbalance it, I should try buying a plant purely to suit a place ! I have that carnation in my garden and received it from my neighbor. I do like it as it is fragrant and adds the bluish leaves to the garden. The flowers don't last long enough in spring, but if cut back, some bloom happens in fall. 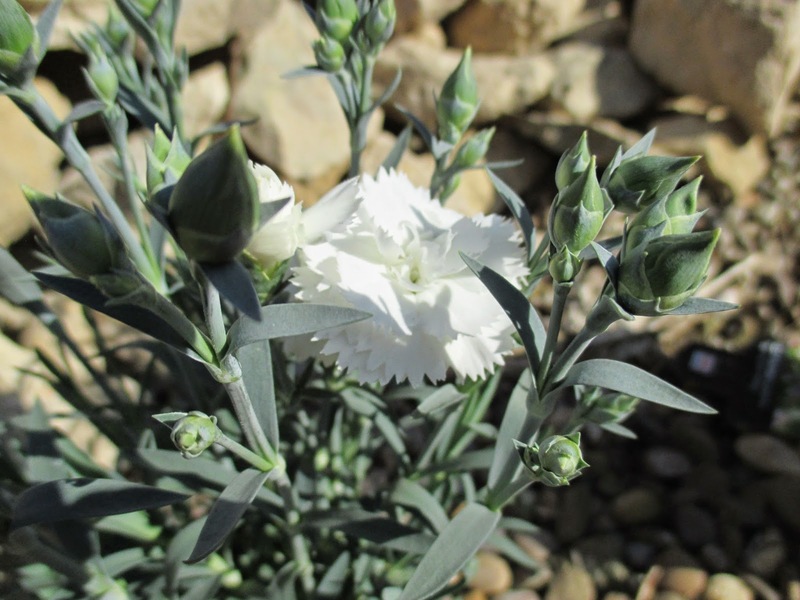 Hi, that is interesting, I never realised that carnations have a short flowering season, and have always assumed it would be long. I am not a fan of carnations either Jane and have to take my hat off to you for buying a plant you don't like. I wandered aimlessly around and found lots of plants I didn't like therefore did not take the plunge. Well done you. I did buy something in bloom but broke the rules/cheated a wee bit. Next month should be different, I spotted lots that I fancied giving a go and were not quite in bloom. Here's my link Jane. Hi Angie, I shall hop over to read your post and see what happened ... I'm intrigued!! Same here Janet, used to hate dahlias and now I couldn't imagine the garden without them ! I need to learn to love chrysanthemums too!! We all have to admit that there are plants we just don't like. I despise cannas but love dianthus, especially 'Bath's Pink'. This little guy might grow on you. 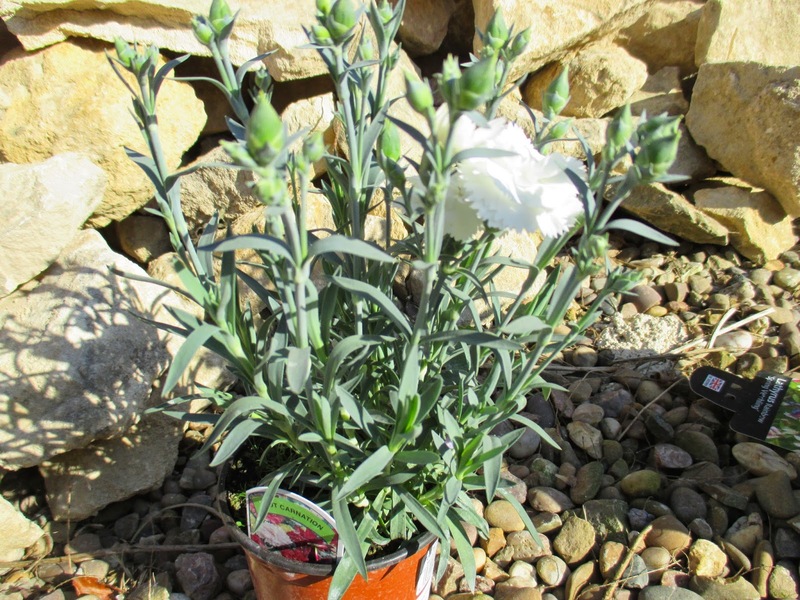 Isn't that odd, Tammy - I am the complete opposite and adore cannas but loathe dianthus ! In my place there have a lot of single layers carnation sell at the nursery. Its look gorgeous but still I'm dare not buy it..worried if not suits with my surrounding..hot weather. Hi Normala, that is an interesting one ... do Carnations lie hot weather ? I have absolutely no idea !! Here in the UK it is not something we have to worry about. Dear Jane, I had to a chuckle a couple of times when I read your post! 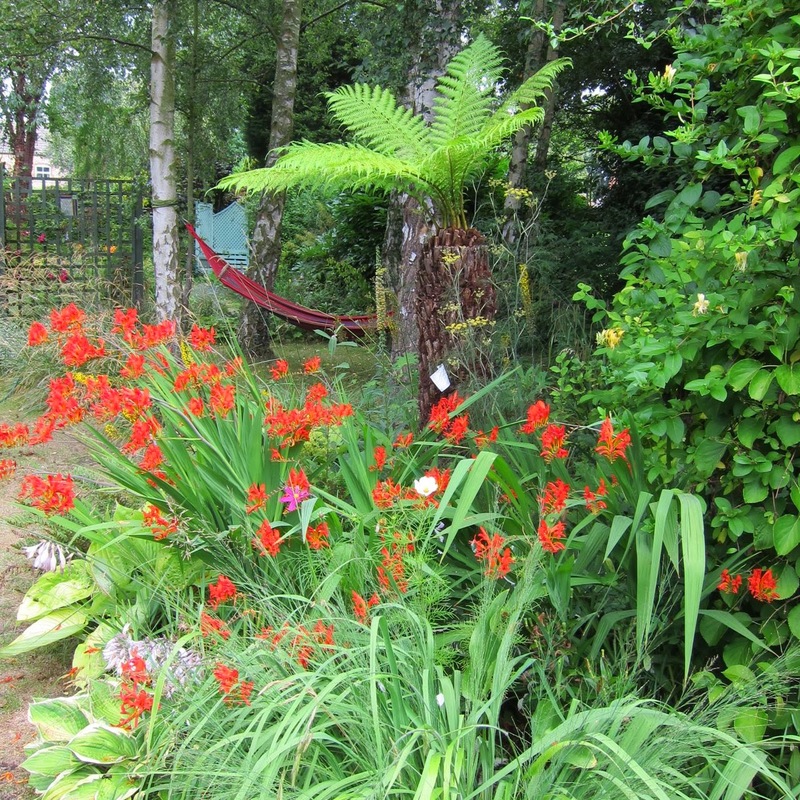 Interesting approach to gardening: Buying plants that you don't like ;-). I actually love carnations especially the pure white ones with the greenish/bluish leaves that you just got. Their fragrance is very pleasing to my nose and I enjoy it quite a bit. hmm... summer heat is not usually an issue for us here in the UK sadly!! I agree that the fragrance is fantastic. I hope your new ones perform well for you and cope with your climate !